Welcome to the third post in our R&Q Q&A series, where we ask R&Q employees from a different region questions about how they make their impact at R&Q. Welcome to the third post in our R&Q Q&A series. Every few months we ask R&Q employees from a different region questions about how they make their impact at R&Q... and the impact R&Q has had on them. From improving people's lives to R&Q's corporate culture, we hope their answers shed light on how R&Q influences the medical device industry and why our employees claim time and time again that working at R&Q is a highly rewarding experience. See current Minnesota openings at the end of this post, and view all R&Q openings on our Careers page. R&Q's momentum in Minnesota continues. We bring Minnesota clients a portfolio of regulatory and quality experience that is difficult to match. 2016 was a busy year for R&Q in Minnesota, with a lot of activity in conjunction with organizations such as Medical Alley, AdvaMed, MassDevice (DeviceTalks), UBM Canon (MD&M events), and a few others. We also secured a brand new Minnesota office, a beautiful and inviting space to talk with current and prospective clients. Throughout 2016, we really focused on expanding our reach and influence in the Minnesota region. This included building a team of experienced R&Q consultants, including key hires like Juli Denny. 2017 has finally arrived, and we believe we're positioned to become a much larger player in the Minnesota medical device community as a whole. We've made the rounds making connections and listening to the needs and experiences of medical device companies, and continuing that in 2017 is vital. One of the biggest events for us early in the year will be the first of four Women in Health Leadership Series events from Medical Alley. As a certified Women's Business Enterprise, R&Q is excited to support the series all year long. What attracted you to R&Q? The (all female) executive team and the culture of energy and passion. In what ways do you think improving lives is different at R&Q than anywhere else? R&Q focuses on the lives of our employees, our clients, and the patients affected by our services. Decisions are made with all three of those stakeholders in mind. How does your role at R&Q feed your passion? Sales is a service. We serve our clients and their patients by providing best-in-class consulting services to our clients. I feel proud to bring our experts to client sites and provide solutions to very complex problems. 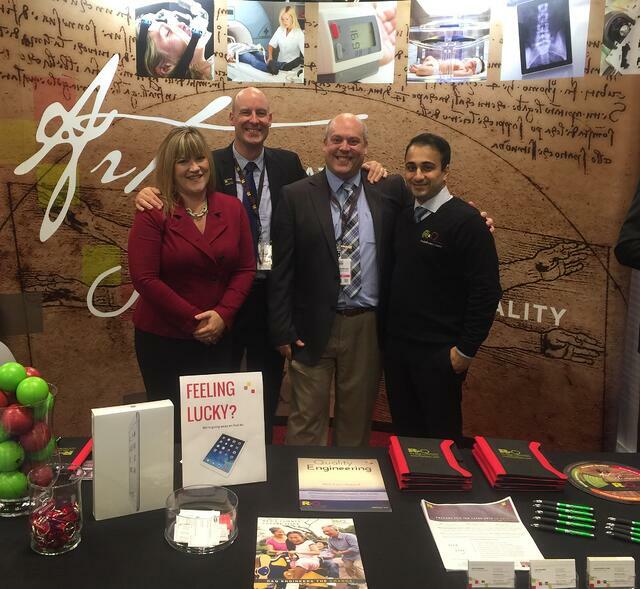 It is fulfilling to work with such intelligent and passionate people who can accelerate the success of our clients. How do your personal goals align to R&Q’s mission and vision? My goal is to work in a rewarding environment where my experience is utilized, appreciated, and trusted. 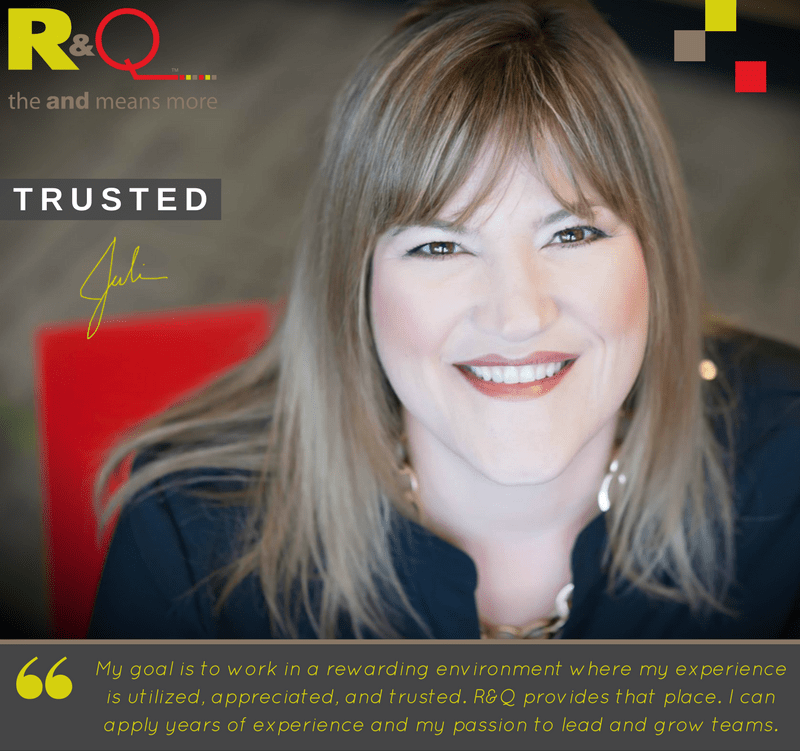 R&Q provides a rewarding place to work where I can apply many years of experience combined with my passion to lead and grow teams. What makes R&Q special or unique in the Minnesota market? R&Q is unique in Minnesota where so many clinical CROs employ a few regulatory and quality consultants at each firm. R&Q is a powerhouse regulatory and quality consulting firm providing 80+ experts to successfully fulfill programs large and small. R&Q brings a breadth and depth of experience that is unparalleled in MN. The Senior Engineer applies their knowledge to the delivery of regulatory and quality solutions to enable client success. The Senior Engineer delivers work products and executes the defined consulting scope of work with minimal oversight by experienced consultants. Learn more and apply. The Senior Principal Advisor is becoming a recognized industry technical expert and serves as a subject matter expert and mentor for staff and the senior technical interface for clients. The Senior Principal Advisor transforms both R&Q and the client’s business by ensuring the delivery of regulatory and quality solutions that are best practice and innovative to enable client success through delivery of superior service either individually or by leading a team. The Senior Principal Advisor is able to lead programs for R&Q. Learn more and apply. The Marketing Director will have primary marketing responsibility and ownership which requires developing strategic and tactical marketing plans that will drive brand recognition and produce maximum results in enabling sales and expanding our reach in targeted regions. Responsible for developing market opportunities and enabling sales execution via a variety of channels. The marketing director owns the development of marketing strategies to drive growth and differentiate R&Q in the marketplace. Prepares and executes multi-channel marketing strategies in support of accelerating sales. Engages strategically with the marketing manager, sales team and key customers to grow the R&Q brand, advance market development and enable sales. Experience with website search engine optimization. Defines, tracks, and reports metrics to track performance and return on investment. Cultivates strong relationships with industry leaders, professional organizations, and other external customers. Sets goals, ensures that they are met, and is responsible for continuous process improvement. Learn more and apply. R&Q is all about people, culture, community, and connectedness. We want to get to know you, whether there's a current opening or not! We want to hear from you, chat with you, and learn more about you... and job postings can sometimes get in the way of that. Ask us questions. Once we get to know each other, we'll know exactly what type of role is perfect for you if/when a position becomes available. So why wait? Apply now. At R&Q we welcome driven professionals of all ages, backgrounds, and areas of expertise to our team, fully confident they will jump headfirst into their positions and find their own unique niche in the R&Q community.